Floor Restorer specialises in cleaning, sealing, restoring and maintaining all types of stone, terracotta, ceramic and composite floors. We have many years’ experience working on all kinds of projects both contemporary and traditional. If your existing floor is suffering from dirty grout lines, stains, cracks, scratches, holes, broken surfaces, lippage, or you just can’t seem to keep your floor looking clean for more than a week, we are here to help. If you are considering a new stone (or polished concrete) floor, or you have recently had a new floor laid and are not happy with the result, then our premium grinding service has many benefits. Using our extensive knowledge, specialist machines and products we can achieve exceptional results and are dedicated to making your floors beautiful. If your floor is looking tired and is difficult to clean satisfactorily, it usually means a professional floor restorer is needed. We will deep clean your floor, remove old and worn sealants, condition the surface and then re-seal according to the stone type and your specified finish. We use as few chemicals as possible but all our products are environmentally friendly and 100% safe. Our services apply not just to floors but to bathrooms, vanity units, fireplaces, stone staircases and stone table tops. 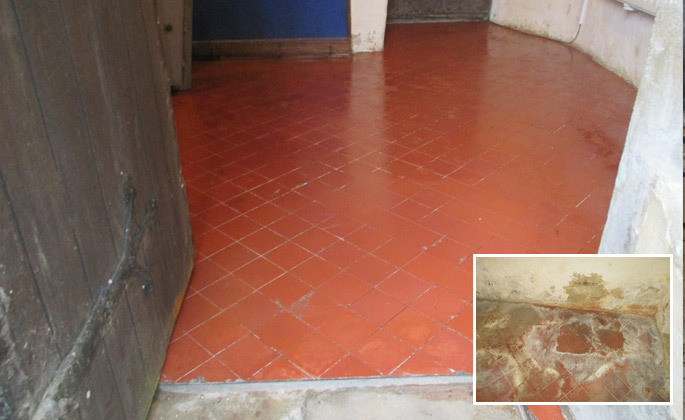 Expert restoration techniques are applied when treating a floor that has a specialist finish or needs resurfacing, re-grouting or parts of it need replacing. 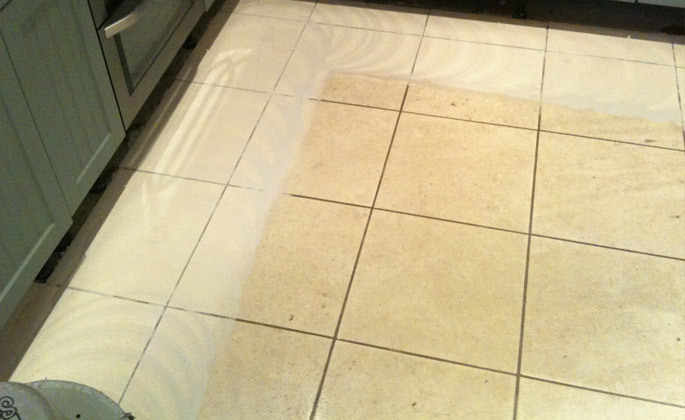 We have completely restored badly scratched marble floors to an immaculate finish. We have repaired 300-year-old flagstones that were deteriorating and needed sympathetic restoration to save them. We have renovated Victorian pressed clay tiled floors which the owners thought they had no alternative but to replace. We can make small cosmetic repairs including filling cracks and holes. We can also source any type of reclaimed and new stone and tile to blend in with existing floors. We obviously cannot guarantee an exact match as natural stone is subject to variation in colour and texture and man-made tiles will vary according to the batch, but we will do our very best. Please also note that large format tiles are very difficult to remove in one piece, particularly if they have been laid with modern adhesives or concrete, and will therefore need to be replaced rather than re-laid. 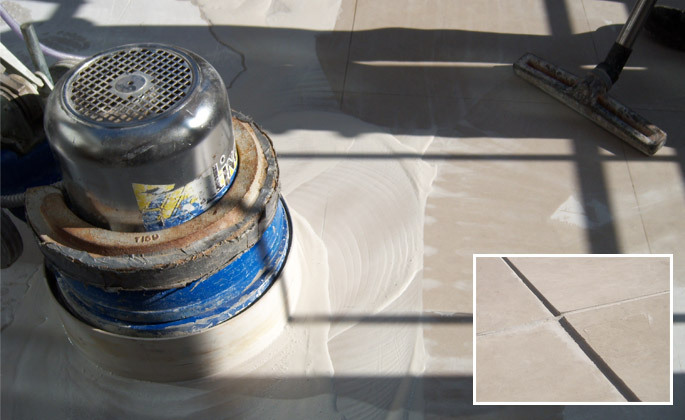 Using a technique learnt from experts trained on the Continent, we can grind stone floors perfectly flat, eliminating any joints, grout lines or lippage. These floors are ideal in high traffic areas where the finish has been consistently worn. We can achieve a finish from matt all the way up to a highly polished surface. 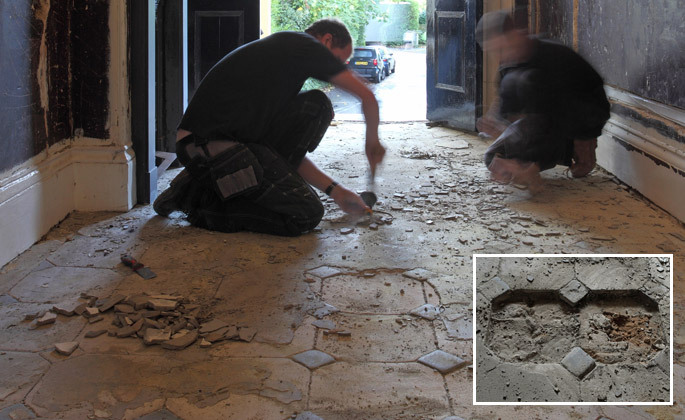 One of our most popular specialist services is to remove lippage on floors where tiles are not quite flat, but with a ‘lip’ in between the level of each tile, creating a trip hazard. This could be because of the way the tiles were laid or how the stone was cut, stored or finished in the manufacturing process. We can also remove most scratches and chips and fill holes and surface damage to stone floors, although it does depend on how deep these are. We can polish all sorts of stone including marble, limestone, travertine and honed slate. Stone polishing actually polishes the stone to achieve the finish, rather than applying a chemical polish. Although stone polishing requires an impregnating sealant to be applied to protect the floor from staining, no topical (surface) sealant is needed which makes it much more straightforward to maintain. It is a technique widely used across Europe in hotels and commercial properties where there is high traffic. A polished stone floor always looks better and retains its shine much longer than using a product. 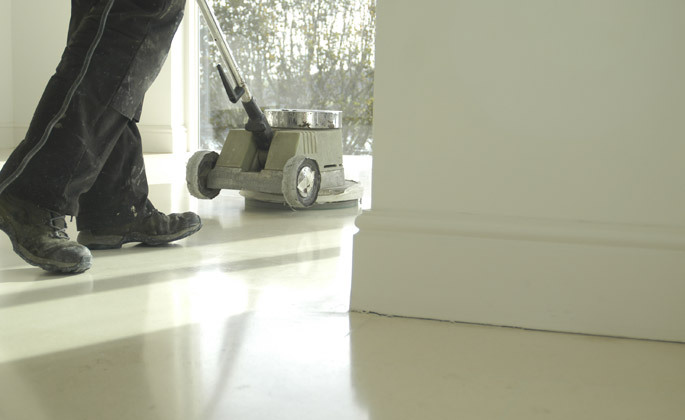 However, to keep your floor looking its best, it will require occasional buffing with a specialist buffing machine which we are happy to undertake for you. Impregnator – absorbed into the surface of the stone or terracotta to provide protection. This is the most common type of sealant used as it does not affect the surface finish. Different types of sealant can change the appearance of the stone such as intensifying the colour. Surface (topical) – these sit on top of the stone or terracotta to provide protection. They are usually applied to achieve a self-shine film to the surface of the tile. Often used after an impregnator has been applied in the case of more porous surfaces such as terracotta. Through our extensive experience of all types of sealants, we can identify the correct sealant to apply to your floor type. Please note that sealants are not impenetrable barriers! Rivened – undulating natural surface such as a traditional slate floor. Honed – smooth, flat surface that is not polished (matt or satin in appearance). Tumbled and unpolished – rounded and worn or bevelled edges which have been artificially applied such as tumbled marble often used in mosaics. Polished – smooth, flat, shiny surface mechanically applied such as polished marble, limestone or granite.